Across the world, forests, trees on farms, and agroforestry systems play a crucial role in the livelihoods of rural people by providing employment, energy, nutritious foods and a wide range of other goods and ecosystem services. They have tremendous potential to contribute to sustainable development and to a greener economy. Yet, clear evidence of this has been lacking. This evidence is critical to inform policies on forest management and use, and to ensure that the benefi ts from forests are recognized in the post-2015 development agenda, not only with respect to the environment, but also for their contributions to broader social issues. 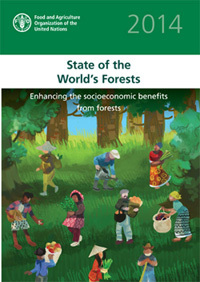 This edition of State of the World’s Forests addresses this knowledge gap by systematically gathering and analysing available data on forests’ contributions to people’s livelihoods, food, health, shelter and energy needs. Crucially, the report also suggests how information might be improved and policies adjusted, so that the socioeconomic benefits from forests can be enhanced in the future. The State of the World's Forests reports on the status of forests, recent major policy and institutional developments and key issues concerning the forest sector. It makes current, reliable and policy-relevant information widely available to facilitate informed discussion and decision-making with regard to the world's forests.